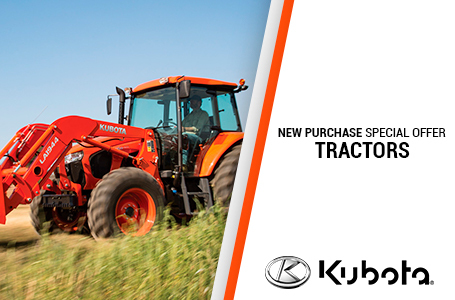 Bi-Speed Turn: Kubota exclusive Bi-Speed Turn makes the M6 mid-range utility tractor turn much tighter than other tractors in its class. This gives the operator the ability to navigate around tighter spots and make shorter end-row turns. 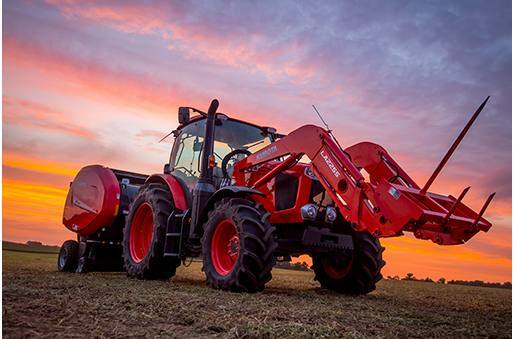 When Bi-speed Turn is enabled, the front axle is driven 60% faster with the wheels are turned at a 35° or greater angle, pulling the front end of the tractor around and creating a tighter turn. Grand X Cab: The M6 Series tractors come equipped with the class leading, 4-post Grand X Cab. This is one of the largest cabs in the mid-range utility tractor market, giving the operator excellent visibility with nearly a 360° around the tractor. Comfort is also included, with a standard air ride seat and controls ergonomically placed for ease of use and less fatigue for the operator. 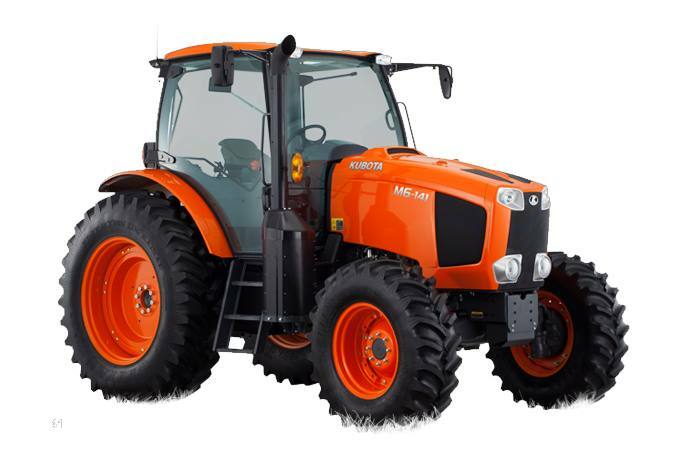 Intelli-Shift Transmission: All four models of M6 tractors feature Kubota's 24 Speed Intelli-Shift transmission. The Intelli-Shift transmission features 8 powershift gears in each of the three ranges. With the powershift buttons and the range lever incorporated together, finding the right gear for field work or travel is simplified. Each M6 also includes two Auto Shift modes, for Travel and Field work, giving the M6 the ability to work smarter and more efficiently for the operator. The M6 Series also includes a left-hand electro-hydraulic forward/reverse shuttle that is cleverly located behind the steering wheel, enabling the operator to shuttle from forward to reverse without removing their hands from the steering wheel. Deluxe Flow-Control Rear Remotes: When precision and ultimate control is needed for rear attachments, operators will appreciate the deluxe flow-control rear remotes. This gives the M6 Series' pressure compensated, fixed displacement hydraulic system finite control and precise operation. M6 Series Engines: M6-101 - 97.1* net engine horsepower, 82** PTO HP; M6-111 - 106.8* net engine horsepower, 92** PTO HP; M6-131 - 123.2* net engine horsepower, 104** PTO HP; M6-141 - 133.0* net engine horsepower, 114** PTO HP; *ECE-R24 rating @ Rated Engine RPM; ** OECD Code 2 rating @ Rated Engine RPM. Suspended Front Axle (Optional on M6-141 Only): When putting power to the ground is key, the M6-141 can be equipped with the optional front axle suspension. To maintain soil contact and maximize 4-wheel pulling power, the front axle suspension keeps the front tires on the ground - especially when pulling high draft loads or heavy 3-point attachments. Front axle suspension also adds another level of comfort and security while traveling to absorb bumps in the road or rough terrain.